This image, made by combining 150 hours of archived Chandra data, shows the remnant of a supernova explosion. The central bright cloud of high-energy electrons is surrounded by a distinctive shell of hot gas. The shell is due to a shock wave generated as the material ejected by the supernova plows into interstellar matter. The shock wave heats gas to millions of degrees, producing X-rays in the process. 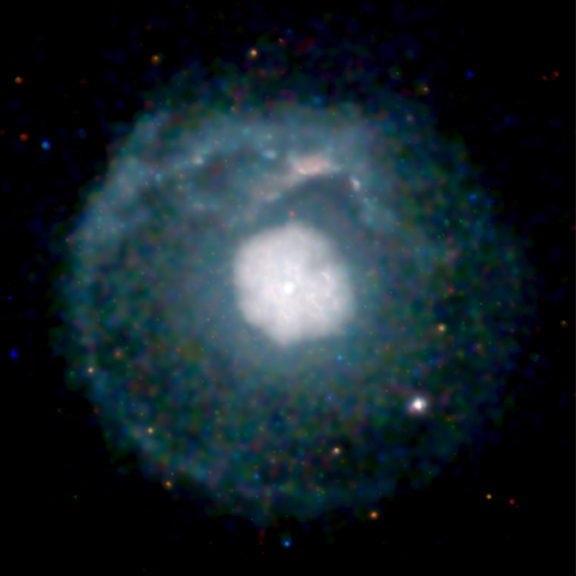 Although many supernovas leave behind bright shells, others do not. This supernova remnant, identified as G21.5-0.9 by radio astronomers 30 years ago, was considered to be one that had no shell until it was revealed by Chandra. The absence of a detectable shell around this and similar supernova remnants had led astronomers to speculate that another, weaker type of explosion had occurred. Now this hypothesis seems unlikely, and it is probable that the explosion of every massive star sends a strong shock wave rumbling through interstellar space. Some supernova shells are faint because of the lack of material around the star before it explodes. Rapid mass loss from the star before the explosion could have cleared out the region. By examining the properties of the shell with an X-ray telescope, astronomers can work back to deduce the age (a few thousand years), and energy of the explosion, as well as information about the state of the star a million years before it exploded. The star that produced this supernova shell is thought to have been at least 10 times as massive as the Sun. Scale Image is 6.3 arcmin per side.